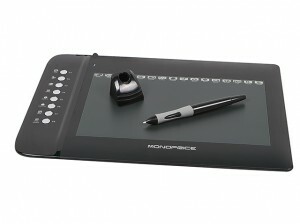 A few weeks ago, I read a post by Ray Frenden about an alternative to Wacom tablets from a company called Monoprice. Turns out they make a bunch of different tablets, much like Wacom, without the hefty price tag. I’ve had a medium sized Wacom Intuos tablet on my wishlist at Amazon for a year now and the price barely budged, even when Wacom introduced their new tablets last month. I ended up buying the Monoprice 10×6.25 inch graphic drawing tablet with 8 hot keys for $50, which is extremely affordable. Even the low-end Bamboo tablets from Wacom don’t come down to that price. What made me decide to purchase is the customer reviews. Everyone who purchased one was incredibly satisfied with their experience. I got mine yesterday and installed the drivers and got it up and running last night. At first, it didn’t seem like the pen was tracking right, but after I restarted my Macbook Pro, it seemed to track better. There seemed to be a little latency in some of the brushes in Photoshop, but I’ve seen the same latency with the Wacom tablets there. The tablet comes with software controllers that don’t install as a preference pane in OSX. There’s a strip at the top of the tablet with assignable items. You can assign these to open applications or other commands, similar to Wacom. There’s also 8 pre-assigned buttons down the left side of the tablet with functions such as copy, paste, group, zoom in/out, save, and close window. The pen requires a AAA battery, which is different from Wacoms pens. The battery powers up the pen on contacting the tablet. If you’re not using the pen, it powers itself off, there’s no switch. It has a plastic nib that feels spring loaded and a toggle switch with two programmable buttons. One thing about the pen is that it doesn’t have an eraser, like all of Wacoms pens. The pressure sensitivity is remarkable. It registers really light touches well. I was surprised. I have noticed that in some programs with the Wacom tablet, that these light touches don’t register at all. I find myself having to configure brush settings or tablet settings often. Overall, I’m very satisfied with this find and I would highly recommend to others who have been wishing that they could afford a tablet to seriously look at this one.